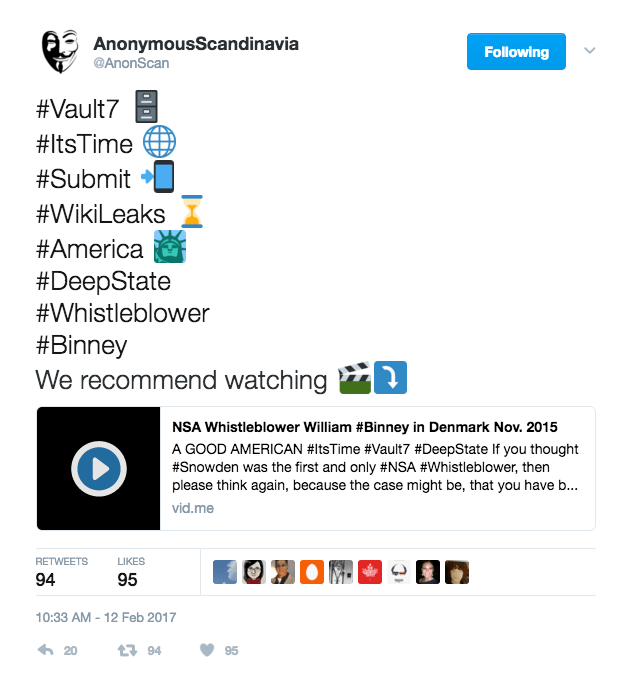 I saw a lot of tweets go out about the documentary “The Good American.” Remember Edward Snowden tweeted about it on February 3? 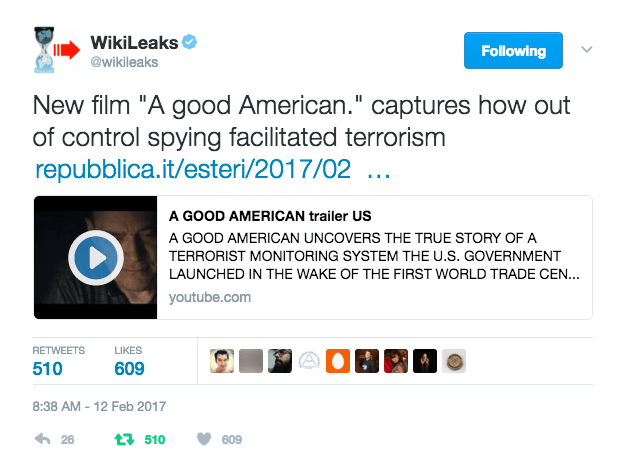 Today, Wikileaks sent out a tweet with a link to the documentary’s trailer and an article saying, “New film ‘A good American.’ captures how out of control spying facilitated terrorism.” The documentary was produced by Oliver Stone and I have to say it looks way juicy in a deeply disturbing way. 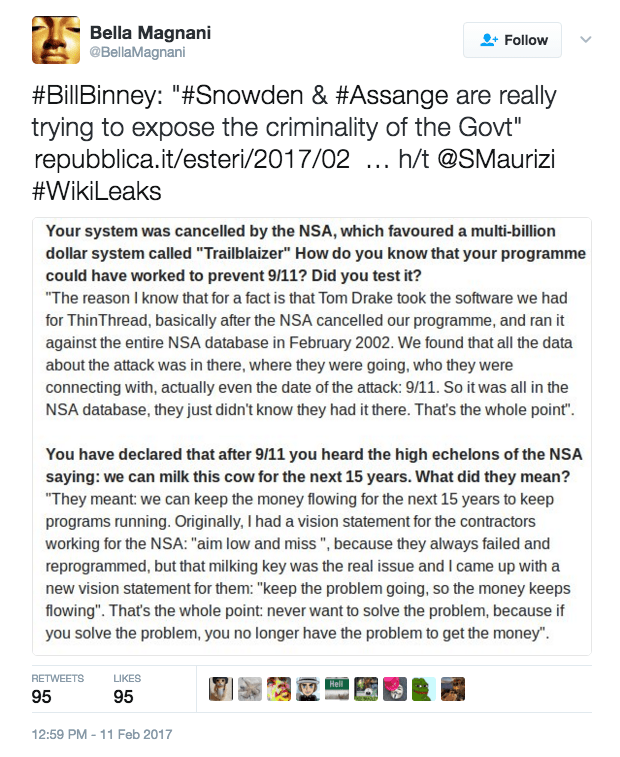 If you’ve never heard of Bill Binney, he was an NSA metadata specialist who believes that 9/11 should have never happened. While you’re waiting for “The Good American” to be released check out ThinThread. And did you notice the trailer mentions the STASI ?! (Hand typing on a keyboard, looks like it’s from a “You have been hacked article)To make it a place worth living in. 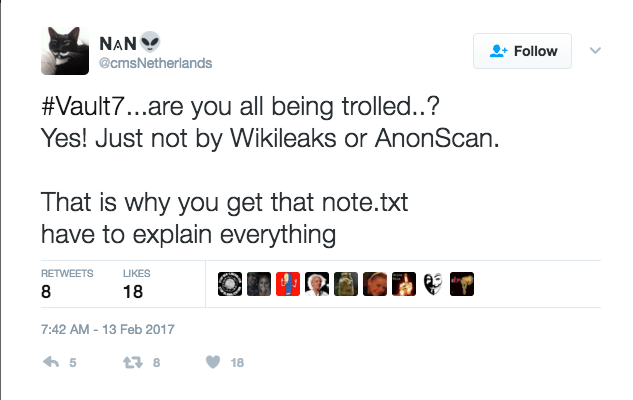 I missed this tweet on February 12th, as well. 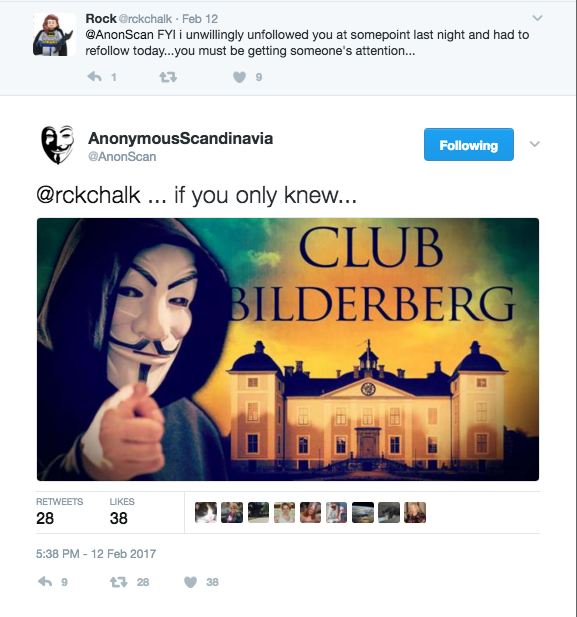 We could be here for days about Bilderberg but for the sake of this post I’m only going to point out a few people that have been a part of Bilderberg: Steve Cohen (Google/Alphabet), Carl Bildt (former Swedish PM), and the Clintons. And on and on we go. 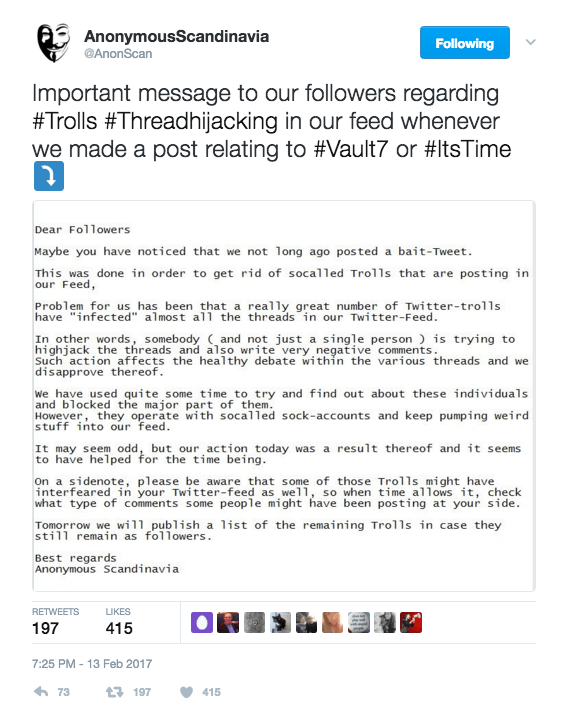 Many of you, including myself, have noticed the trolls cropping up on Twitter (“or are they trolls? some ask) and I get it. People are confused, maybe even scared. But let me point out that trolls and tactics of that nature are nothing new and have been used time and time again, especially when we’re talking about big anti-establishment stories, politicized trials, or even presidential elections. 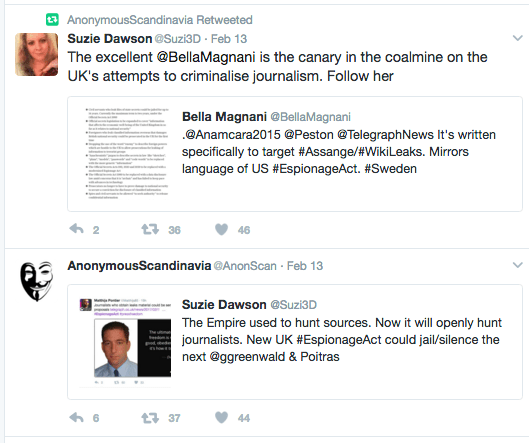 I would say that the use of disinfo at this point is so cliche if it wasn’t so effective. But I wouldn’t let what appears to be disinformation, questionable information, or even contradictory information freak you out. It happens all the time. Literally. What I will say about all of this is that everyone should be safe and smart. 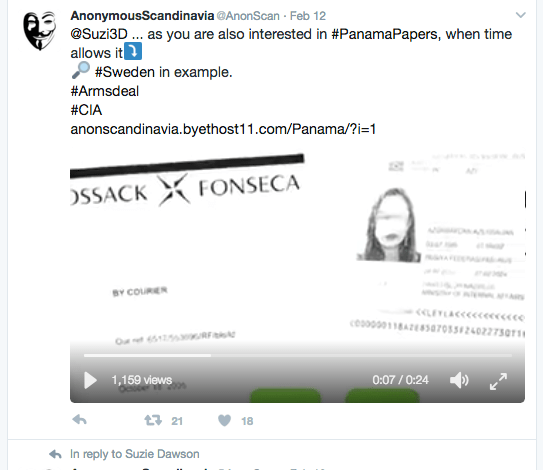 Never assume you know who you’re talking to or who’s behind that profile you’re following. I’m not saying they’re not who you think they are but I’m not saying they are, either. 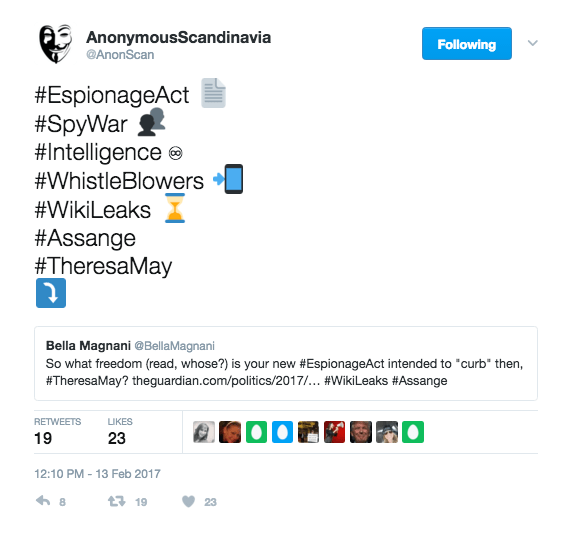 Don’t believe everything you see or read and that includes this blog. I’m simply regurgitating online information with a bit of commentary thrown in. With that said, I’ll continue posting on here but don’t consider the information I put on here as an endorsement of truth. Nor should you assume that anything I don’t add isn’t worth further investigation. I was probably on my first cup of coffee and missed it. 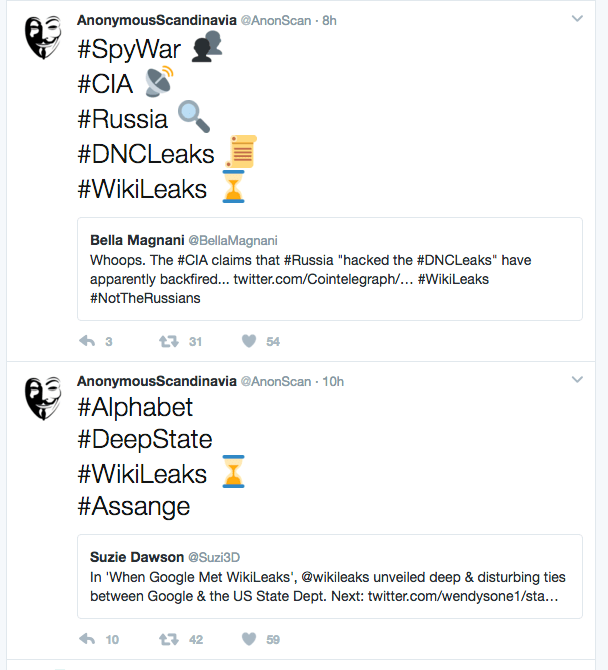 Soooo, with all of THAT said, I found what Wikileaks tweeted today (and yesterday) fairly interesting within the context of the last twenty-four hours. 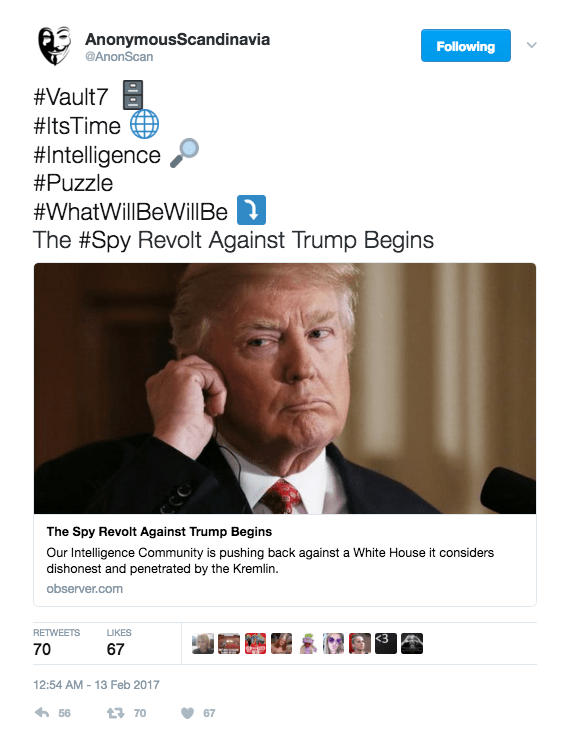 The tweet from yesterday stated, “New German President Frank-Walter Steinmeir was target of systematic NSA/ODNI spying” and also included links to both an article as well as Wikileaks docs that provide evidence of the NSA’s tactics. 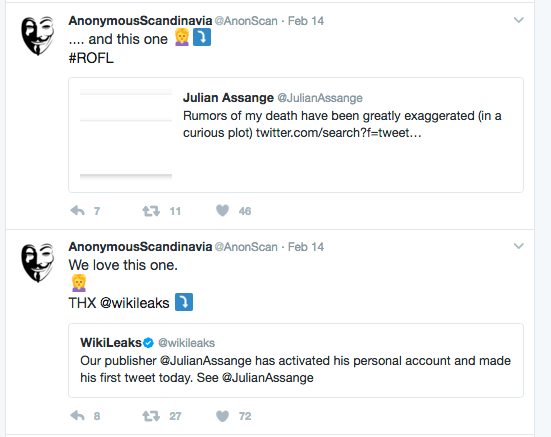 So yeah, this is probably just Wikileaks again letting the public know just how widespread and insidious the NSA’s surveillance program can be. 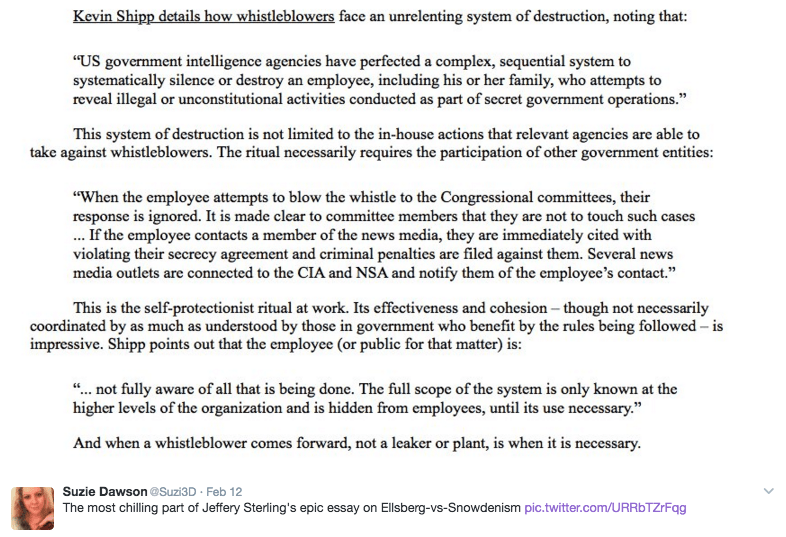 Or perhaps a nod to Snowden. Let’s not go overboard here. Okay, let’s go a little overboard. 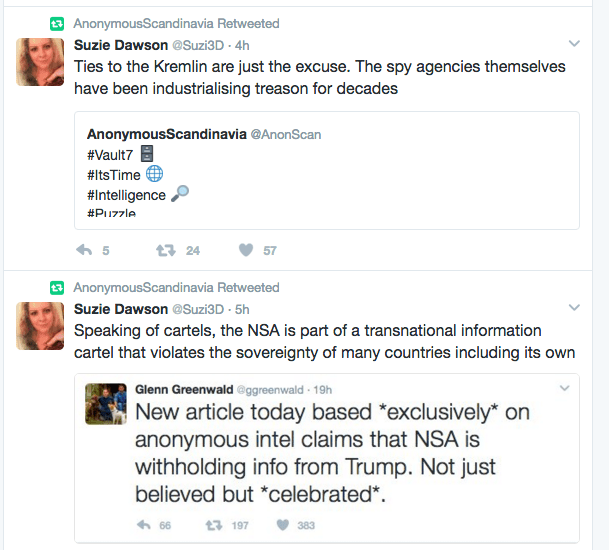 What I’m taking from all of this is that there is a rift in the intelligence community. You have those who have been dirtying their hands with the Clintons (and others) for years and now you have the Trump administration who maybe is not so willing to get dirty. They may even want to clean up the joint which, of course, would not make HRC followers happy bedfellows. 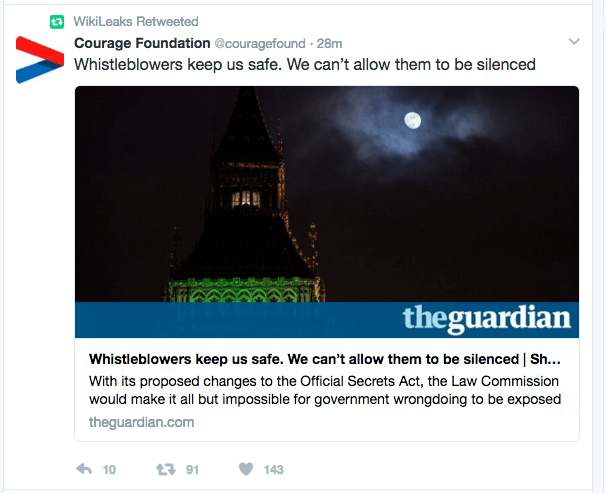 What I’m leading up to here is that perhaps that that file Wikileaks put on their back end page yesterday, the one encouraging conspiracy theories to be stopped, was a warning to the NSA. 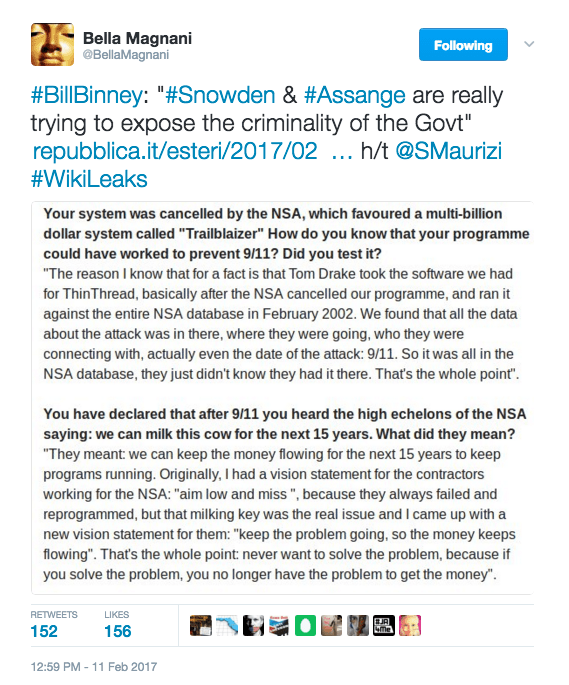 Or maybe Wikileaks was just in an NSA mood because both of those articles came out yesterday. 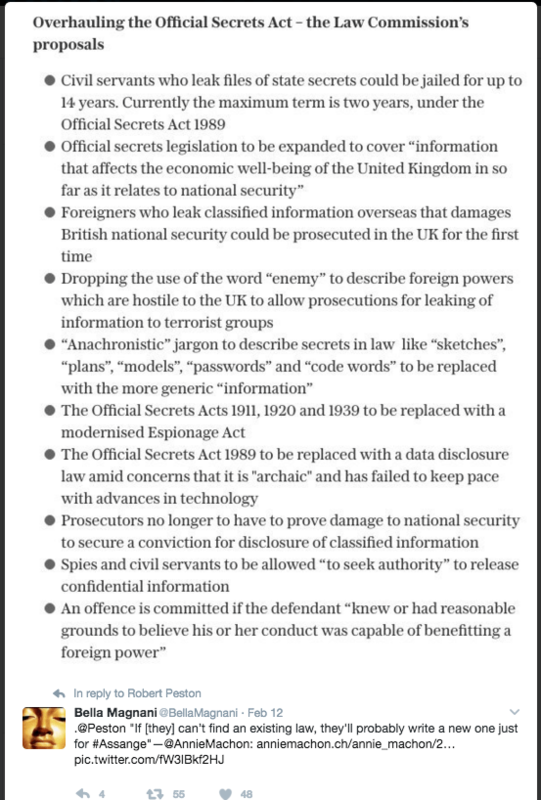 Many of you are also aware of the UK’s move to restrict whistleblowers and journalists and this could just be an extension of this. …and last but definitely not least, a new clue! 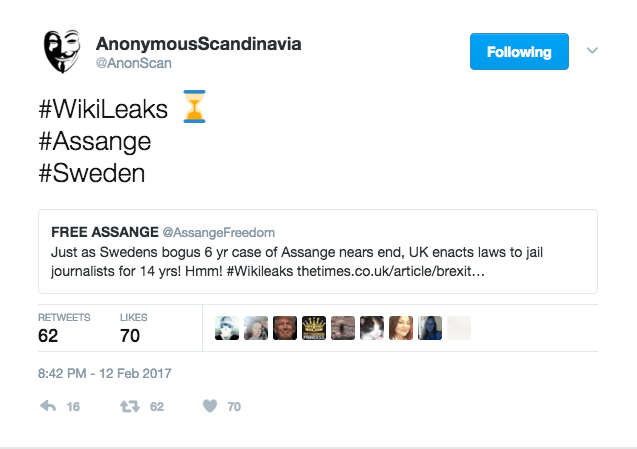 @AnonScan’s status also included three retweets: Embassy Cat video with Sarah McLachlan in the background (from Jan. 29), second Embassy Cat video (from Jan. 30), and the Assange “Turn the Pages Over” video (from Jan. 30). 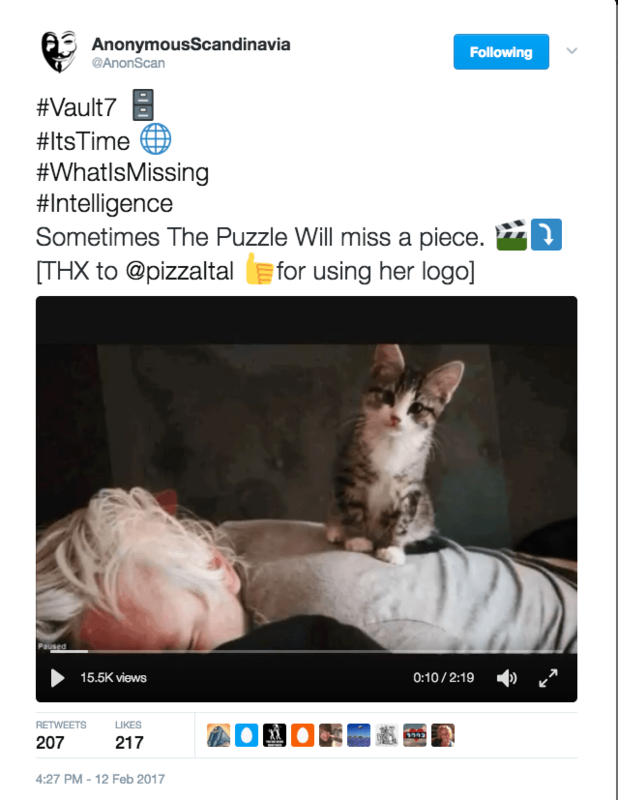 Clink on the “a new clue” link above to read all four clues that were attached to the tweet. 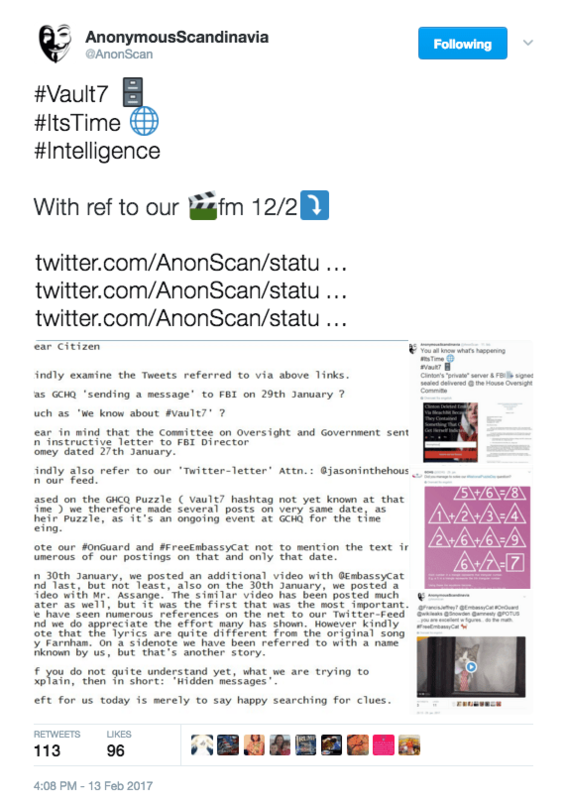 In response to this latest clue someone added this and @AnonScan replied. So there’s your answer, guys! 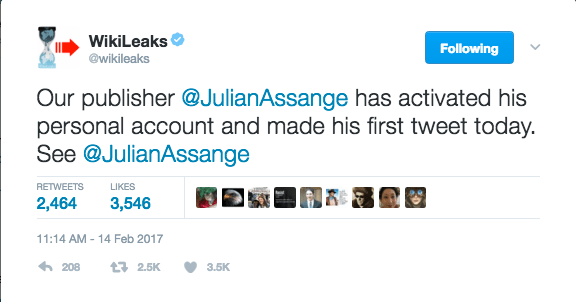 So two big things that happened in the last 24 hours: Flynn and Assange’s first tweet. 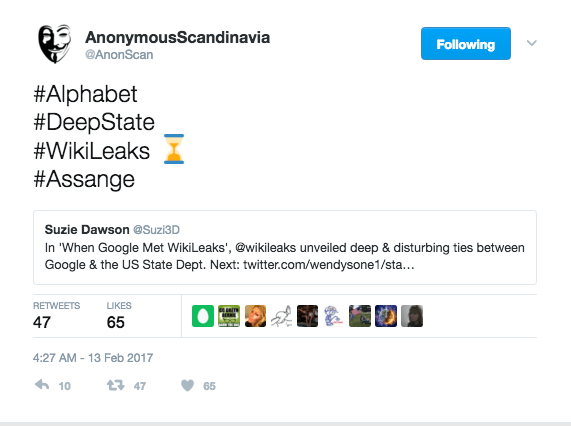 I’m sure everyone out there already knows that Flynn resigned, Wikileaks tweeted it out, “Trump’s National Security Advisor Michael Flynn resigns after destabilization campaign by US spies, Democrats, press,” and then they included a link to the White House press release. 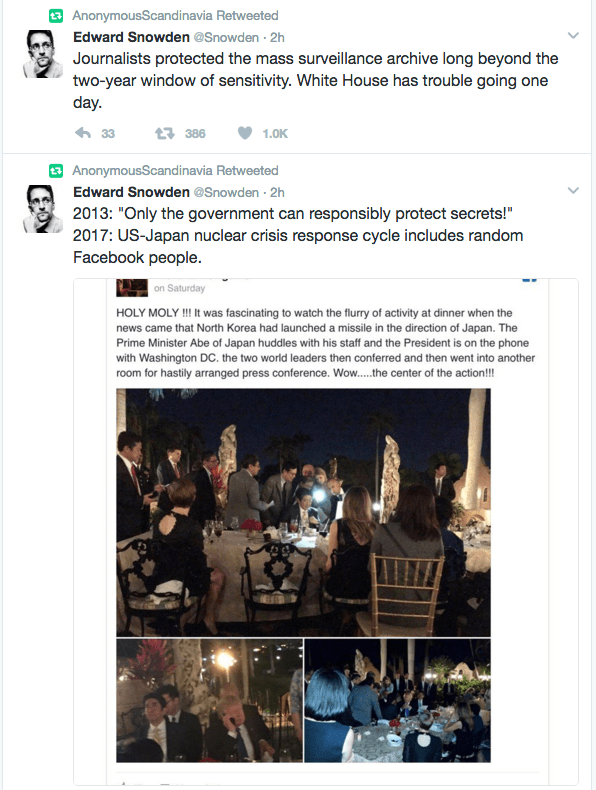 Some speculated that the tweet was essentially coming from the Russians while others blasted the very idea—which they should. 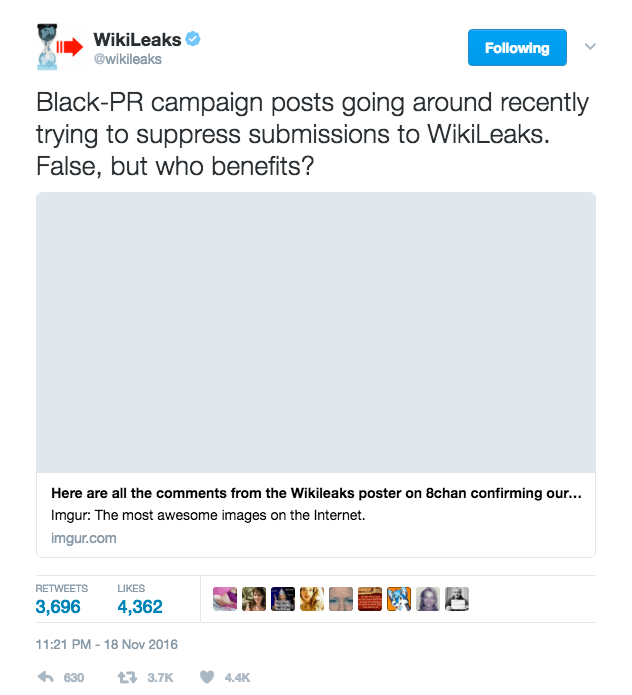 Because there’s no evidence it’s the Russians. Nor has there ever been. Omg, move on. 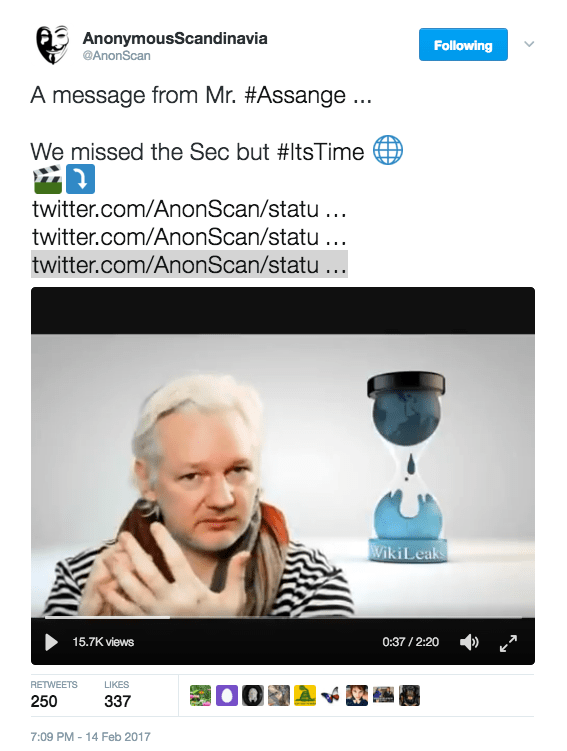 And check out @AnonScan tweet where they posted “A message from Mr. #Assange,” a video of Assange who essentially talks about this Black-PR campaign. 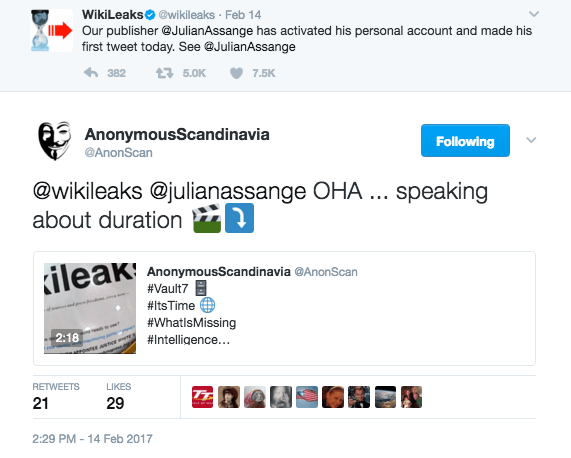 @AnonScan included three of their previous hints in the tweet: their “final hint” video, the Donald Trump interview video, and their Feb. 9 video with “America” playing in the background.